Vladimir Putin's approval rating remained above 80% for a long time, but over the past year it has dropped some. Is it true that Russians love their president? 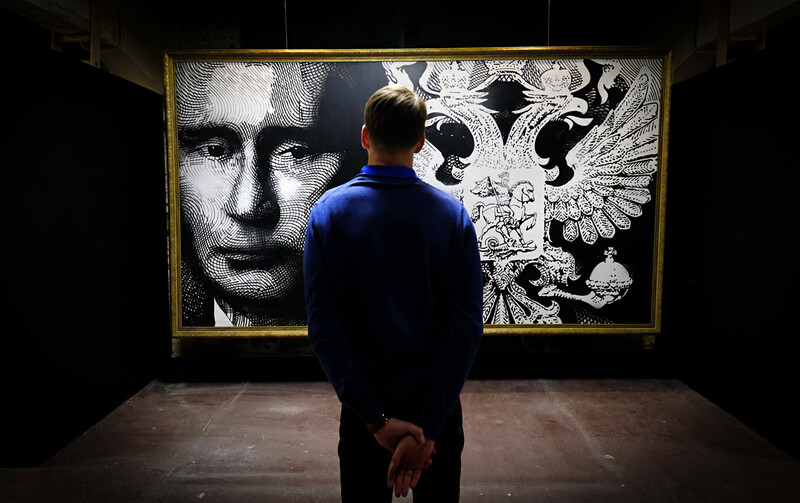 There are dozens of bizarre exhibits and paintings, almost all of them life-size or taller, all with one thing in common: Putin. There is a sculpture of Putin in a medieval knight's armor riding a bear. 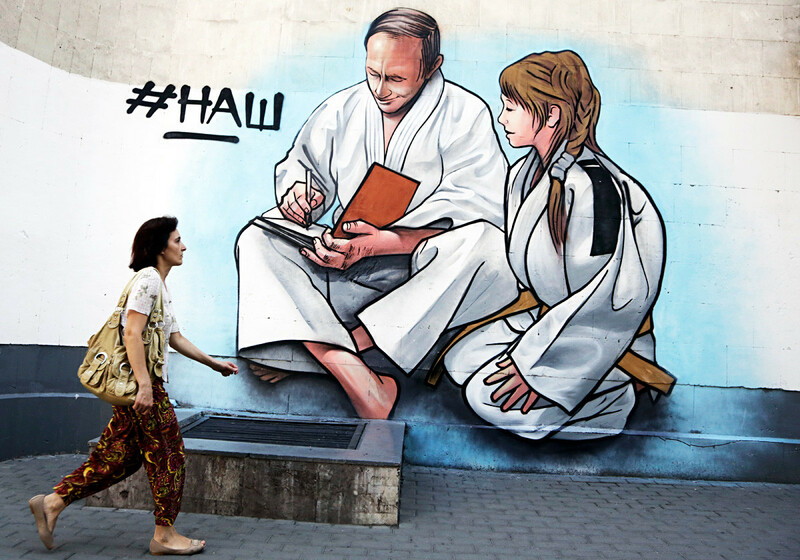 There is Putin depicted as a superhero and a painting of Putin being embraced by a babushka. A Putin bust and a comic strip about him on a huge canvas. This scene took place in December 2017, when Moscow was hosting an exhibition—and not even the first of its kind—dedicated to the Russian president. The exhibition was called SUPERPUTIN, and several years before a similar display was put on in Moscow and London. In these, Putin was depicted—ironically or not is unclear—as Buddha, Joan of Arc, Che Guevara, Sherlock Holmes and many others (really, it would be quicker to list the iconic figures that were not used than those who were). This may look like a commissioned project as part of a political campaign—although the organizers insist that they simply have a "positive" attitude toward the president—especially since the SUPERPUTIN exhibition opened shortly before the presidential election. But, until recently, your average Russian would not have seen anything strange in this attitude. According to approval ratings published by both state and independent pollsters, Russians still have a high opinion of Putin, whose rating remained consistently high for many years. It was only in April 2018 that it began to slip. "When there is Putin, there is Russia; when there is no Putin, there is no Russia." This phrase, which quickly caught on among Putin supporters, was spoken by the then deputy head of the Kremlin administration, Vyacheslav Volodin (now the chairman of the lower house of parliament), but the idea of Putin as "a living personification of the country" turned out to be popular not only among politicians who support Putin. Judging by opinion polls, this view is shared by average Russians as well. 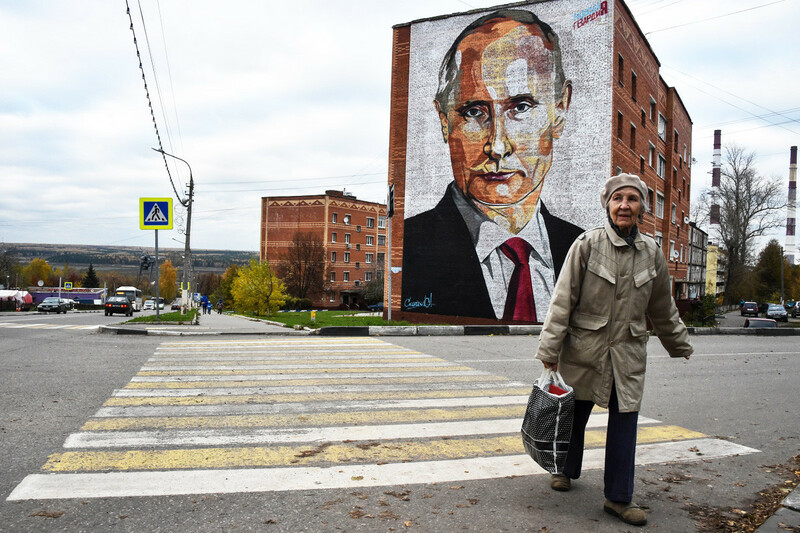 For them, Putin is seen as a guarantor of stability, a figure who pulled the country together again a decade after the traumatic collapse of the Soviet Union. Town of Kashira, some 115 km southeast of Moscow, on October 16, 2017. "It should be appreciated what he [Putin] did compared with Yeltsin's times. It is impossible to leap from a post-perestroika pit straight into space. Little time has passed. Nevertheless, my fridge and my friends' fridges are full, we spend our holidays at resorts, many have moved to new apartments, everyone has a car, which is something that people did not even dream of prior to the Putin era," writes tour guide Yury Bakhaev on a popular online platform called The Questions. "We should start storing provisions because Putin will not last forever. The next president will most likely be from among your 'tolerant' ones, and we shall find ourselves back in 'the nineties' or even worse," writes Alexander Rybakov, 57, for whom "tolerant ones" likely means the somewhat more liberal opposition in Russia. "People remember the times when they could hardly feed themselves and their families," says Gleb Pavlovsky, a political technologist who was instrumental in creating Putin's media image. Pavlovsky has pointed out many times that Putin's popularity was mainly built by pressing on the country’s traumatic memories of the 1990s, when people were not paid their wages and pensions for months. "This is not the case anymore, which is perceived as a huge success rather than something taken for granted." These days, the word muzhik means a tough guy with a strong-willed character (the type of guy that, without saying a word, opens a beer bottle with their eyes and then goes for a walk outside when it’s 40℃ below zero). A true muzhik is the highest praise for a man, and this is what Putin embodies for many Russians. When asked what traits Putin represents, many average Russians use terms like: "courage," "decisiveness," "strength," "self-confidence," "bravery." Russia’s annexation of Crimea was very popular domestically, and following this Putin's rating remained at 80% and above for a long time. It reached a historic high of 90% in 2015, when Russia began its military campaign in Syria. Both these events turned Putin into "a true muzhik" in the eyes of many Russians. "Having taken Crimea, we challenged the world community and acted contrary to Western opinion,” explains Alexey Levinson, the head of socio-cultural research at the Levada Center. “People have a feeling that the country is opposed to the whole world. It is this that in the eyes of the majority of Russians makes Russia a great power [read more to find out if this is really the case] and Putin a strong leader, who did not chicken out." Can someone like Putin make mistakes in the eyes of the public? Most likely, yes. But many Russians do not seem to think so. Over nearly two decades in power, Putin's rating has rarely been dented by domestic political crises. Instead, he comes away unscathed and the blame is usually laid on the cabinet of ministers for “failing to fulfill" the president's instructions. 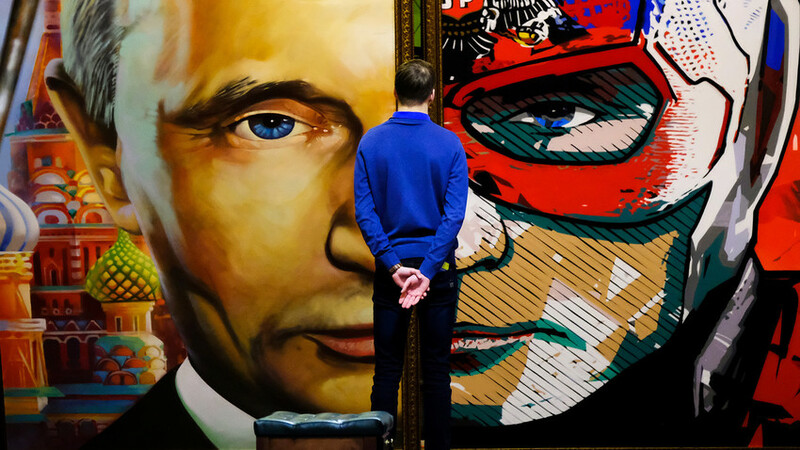 "SUPERPUTIN" exhibition at UMAM museum in Moscow on December 6, 2017. According to some polls, Putin's main "sin" in the eyes of the public is that he "does not know how ordinary people live." It is common knowledge that Putin does not use the internet and does not even have a mobile phone. He receives all his news and information in a folder prepared daily by his assistants. Thus, there is a widespread opinion that “if Putin doesn't know something it is because he wasn't told." Putin's approval ratings have gone down just five times over the years. However, for the first four of them, the drop was not as significant as on this latest occasion. Most experts think this because Putin officially supported a controversial pension reform, which is an extremely sensitive topic for the population. Yet, this fall in his approval rating might be temporary as well. "There have already been similar stories, which left him unscathed," political analyst and president of the Peterburgskaya Politika foundation Mikhail Vinogradov said on an Ekho Moskvy radio program. According to the VTsIOM state pollster, the president's rating fell to a historic low of 32.7% in March 2019. Meanwhile, the independent Levada Center reported a higher figure of 64%. Levinson told Russia Beyond this shows the approval rating has dropped back to its usual level and what it was like before Crimea or the five-day war in Georgia in 2008. "This is the stable level at which Putin's rating stood for many years: two-thirds of Russians consider it necessary to approve of the president as a symbol of the unity of the country and so on. There may perhaps be reasons that would bring it below this level, but for the past 20 years we have not seen it even once. For the time being, people need this rallying point in the form of Putin," Levinson concluded.